There is a range of information and services to help older and disabled people when using public transport. There is an accessible travel section on the Metro website. of mobility scooters on buses. 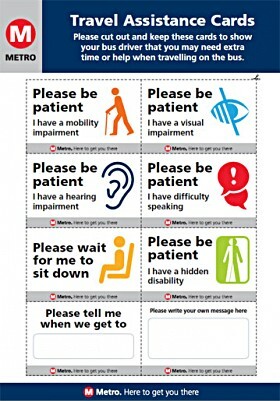 Travel Assistance Cards have been designed to help disabled and older people when using public transport. They can be particularly helpful for people with hidden disabilities such as hearing or visual impairments or learning disabilities and for people who are afraid of falling. You can use the card to let the bus driver know about any requirements you may have when getting on the bus. You can download and print your own Travel Assistance Card. You can also pick one up at the Bramley Elderly Action drop-in, or at Metro bus station travel centres. This scheme is based at The William Merritt Centre, Armley. contact the Centre on 0113 350 8989 and quote “Try b4u Fly”.